Excellent quality single issue MAGAZINE. This magazine truly is like new. NEW “ if they are previously owned I call them “ LIKE. Brand new, but bottom right cornee of cover has very small crease. Model Railroader Magazine Lot of 10 from 2006. Lot of 22 Classic Toy Trains magazines. They are all different with dates ranging from 1988-1996. Buying as is. GOOD LUCK! They are in good to very good condition. 85th Anniversary Issue Bonus First Issue ( VOL #1 / ISSUE #1 ) From January 1934 is also included. Pictures are of the front cover and the back cover as well as the back also shows the front cover of the 1934 first issue magazine. They are dated 11-99, 9-91, 2-84, 11-84, 1-83. The 9-91 issue has a torn cover. they are in good condition for the age. August 1965. October 1965. February 1965. April 1965. March 1965. Model Railroader mag back issue Feb. 1981. Please see pics for table of contents. Considered to be in fair condition upon review. I do my best to describe items as is, as I would hope and expect the same. Fast shipping guaranteed. Any questions, don’t hesitate. Up for consideration is this Vintage June 1978 issue of Model Railroader magazine. Overall looks pretty good for its age. Has some edge wear and spine wear. Would make a great addition to any collection. Please be sure to look at my other listings. I have hundreds of issues of these I will be listing. I have a 40 year collection of Model Railroader Magazines. I will discount shipping to 1 dollar for each additional magazine you purchase that can safely ship together. Free pick up is always welcome. Feel free to contact with any questions. Many other Unique items listed. Thank you for looking. Model Railroader Magazine June 1993. It is in good condition. Their is some tears on the binding and the back page some wear as well. A good magazine to add to your magazine collection. The item will be shipped priority mail. I assure you that everything will be packaged very well. Feel free to message me if you have any questions or concerns. Checkout my other railroad items up for sale. Looking for a particular item? Message me and I can see if I have it or I can get it for you. 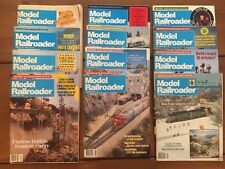 Up for auction, a lot of 5 vintage Model Railroader Magazines, dating from 1967 to 1970. These magazines are March 1967, June 1968, September 1968, August 1969, and September 1970. I’ll have all pages apparently intact; condition is Used. Shipped with USPS Priority Mail. The hobby was growing and the magazine and its advertisers we growing as well. A classic year and very interesting to rummage through. This item is in excellent condition. It is not faded, torn, ripped, and has no dog eared pages. There is nothing that would take away from the value, actually only add to it. For a magazine that is my age, 72 years, it is in truly unbelievable condition. ALSO OPEN TO BULK SALES . October 2000 - Back Issue. Good condition. All 12 Issues January thru December. Very Good Condition.